Apple Pay will work with a Desjardins Visa credit or prepaid card or a Desjardins Interac debit card. Desjardins Cash Back MasterCards, Cash Back World MasterCards and World Elite MasterCards will get Apple Pay in 2017. 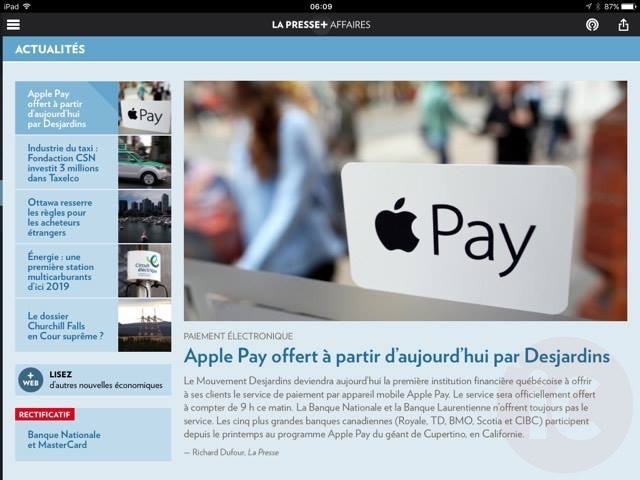 Apple Pay’s launch today means Desjardins joins RBC, TD, CIBC, Scotiabank, BMO, ATB, Canadian Tire, President’s Choice, Tangerine and Amex.